Alliance for Access, a nationwide coalition of civil society organizations, corporations, media houses, telecommunication companies, academics, and student groups to promote open access in Pakistan, condemned the attack on offices of Express Group, one of the country’s leading media houses, in Karachi on Monday evening. This is the second attack on the offices of this media group in four months. “Express News Group has been consistently under threat and the attack follows a threatening statement from Tehreek-e-Taliban Pakistan against media groups and journalists in Pakistan,” the Alliance said Tuesday in a joint press statement. Journalists affiliated with the Express Tribune and those on site reported that the police van usually present at site had been removed a few weeks ago. “This is an attack on independent and progressive reporting in Pakistan,” the Alliance declared. International human rights community have urged the government to commit to end impunity and make public their commitment to free media and safety of journalists across the country.The attack on Express media group comes as a bleak reminder of the dangers and threats journalists face simply for doing their job. The state must take immediate action to fulfil its commitment to protect civilians, especially those on frontlines. Aurat Foundation, Bolo Bhi, Baanhn Beli, Centre for Peace and Development Initiatives (CPDI), Civic Action Resources, Institute for Research Advocacy & Development (IRADA), Centre For Governance & Public Accountability (CGPA), Digital Rights Foundation (DRF), Freedom Network, Individual Land, Punjab Lok Sujag & Sustainable Educational & Environmental Development Balochistan (SEED), & SHEHRI. Alliance for Access is an initiative of Bolo Bhi, a research focused advocacy group for policy change, with the dual goals of promoting open access and protecting fundamental rights to privacy and freedom of expression. an initiative of Bolo Bhi, a research-backed advocacy group for policy change, with the dual goals of promoting access and protecting fundamental rights, as mandated under the constitution, particularly in the digital and Internet space. 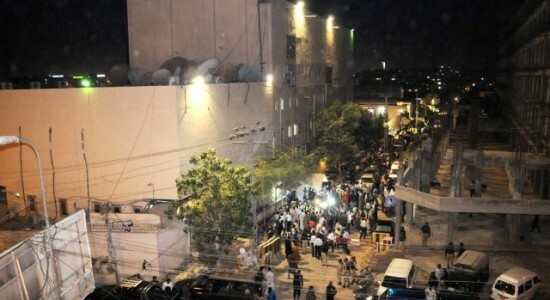 Caption: Security forces rushed to the Express Media Group’s offices following an attack on Monday evening.